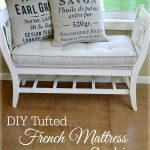 Oh you guys, I love, love, love to share DIY projects like this with you! The easier the tutorial, the better in my book. I don’t think many of us have a lot of extra time to spend on things like decor, but it does make a difference in how we feel about our homes and I believe gives us a lot of joy. So my job (as I see it, anyway!) is to show you that you can add beauty without lots of time or money involved. 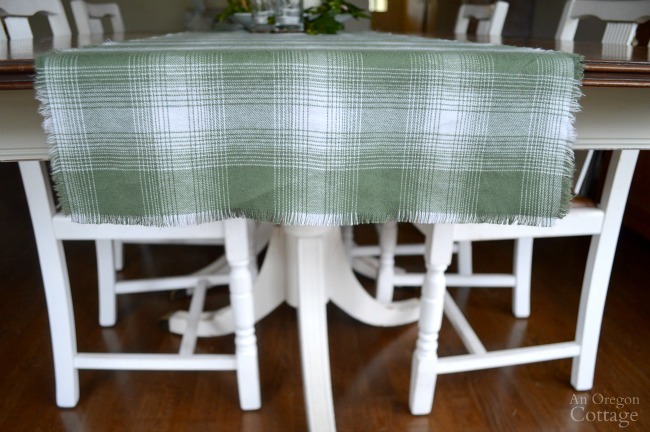 Enter the no-sew fringed table runner – a super easy way to update and freshen your table with basic fabric. 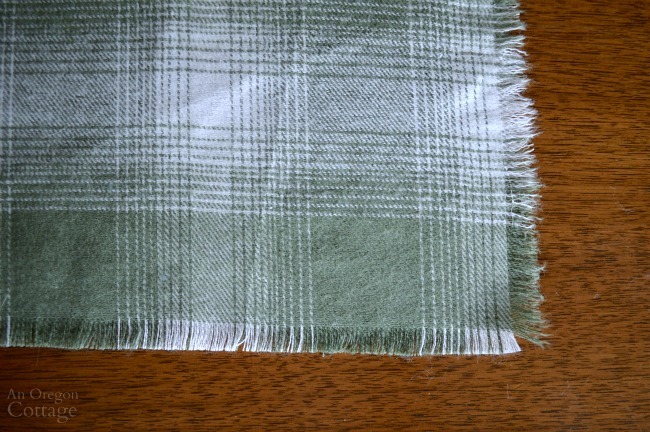 Any natural fabric with a thick enough weave that you can pull the thread from will work: plaid cotton flannel like I used, burlap, linen, and regular home decor cotton fabrics. Ready to make your own, custom table runner? 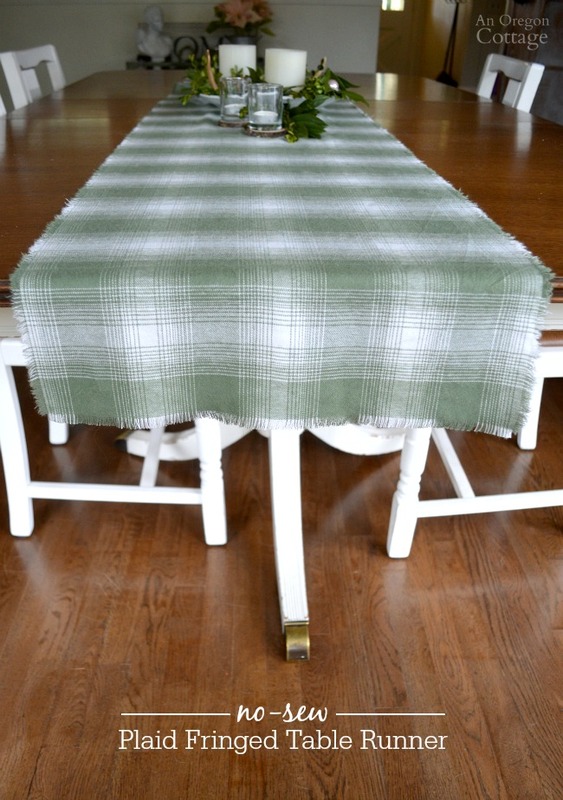 Cut fabric to the length & width you want for your table. My example is 16″ wide by 2-1/2 yards (90″) long. Use a seam ripper (or large pin or other small, sharp tool) to gently pull 2-4 thread of fabric weaving from the edge. Note: every seam ripper I’ve ever owned splits the top as I use it like you see above. Maybe I use a lot of brute force in my seam ripping? Gently pull the loosened threads from the fabric. It will probably break, especially with longer pieces like this. Just pull what you can, use the seam ripper again and pull again. This is something you can do while watching TV or listening to an audiobook to make the time pass quickly! 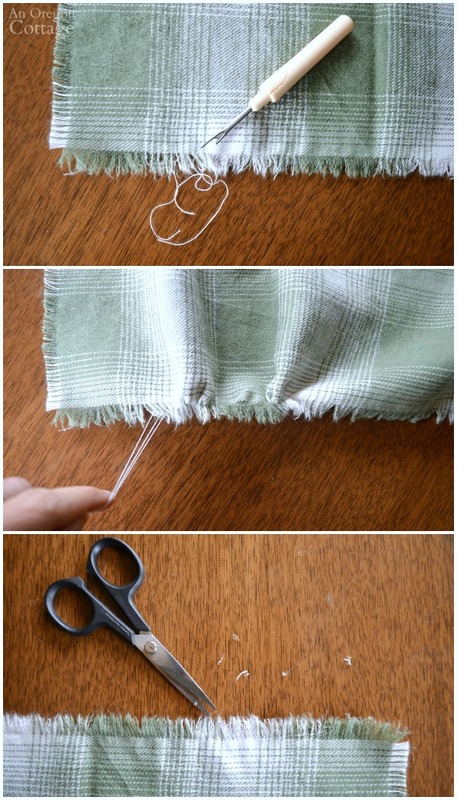 Trim any longer pieces of the fringe as you like with fabric scissors. I know – there’s so much to love about this, right? 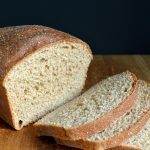 Easy to make, customize and change with the seasons, inexpensive, and just plain lovely! The only issue with no-sew fringed fabric is with washing – some fabrics will ravel even more, especially loose-weaved fabric like burlap. You can hand-wash (if you’re the hand-washing type…) or just enjoy a longer fringe. I’ve found that fabrics like this cotton flannel and linens won’t ravel that much more, so I’m good with washing in a machine. However, there is a way to make sure the fringe stays the original length if you want to sew just a little bit: follow this tutorial that I wrote for making men’s low-sew scarves and you can wash without worry. And now – go make a new runner and let me know how it turned out! Where did you find this plaid fabric? It’s exactly what I’ve been looking for. That was at Joann’s, but I see it’s not available anymore. It was listed as a green flannel shirting fabric – maybe do a google search for it? One of the first 4-H sewing projects, about 60 years ago! Sewed a line 1 inch from the edge, then unraveled to the stitching. Prevents over-raveling.